There is a surprisingly long, sometimes strange history in the effort to bring public transportation to Mount Hood. Private ski buses have carried winter visitors to the mountain almost since the beginning of the south side resorts. Before that, visitors to Cloud Cap journeyed by train, then stage, to reach the mountain at the turn of the 20th Century. 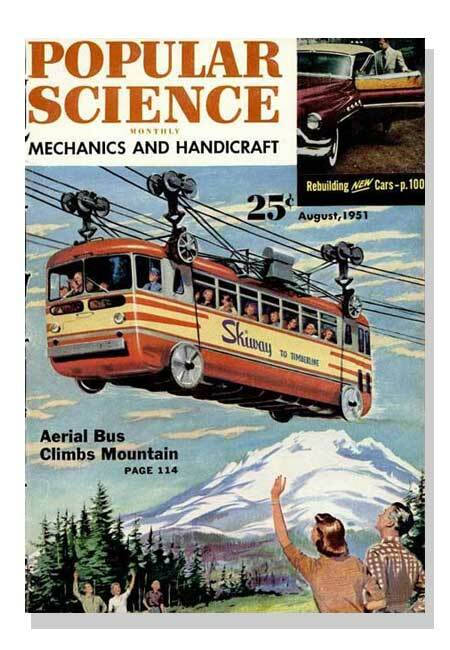 Perhaps the strangest episode was the brief reign of the Skiway to Timberline, an ungainly gondola scheme consisting of a customized bus suspended on a cable lift. 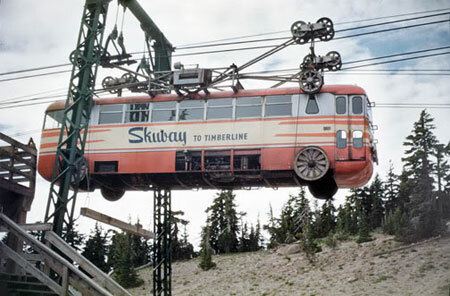 The Skiway carried skiers from Government Camp to Timberline Lodge in just 10 minutes, with two modified coaches called “Cloudliners” custom-designed for the circuit. Was the Skiway to Timberline ahead of its time? The system cost a hefty $2 million when it was completed in 1951, but only operated until 1956 due to chronic mechanical problems and disappointing interest from skiers. Though it seems absurd now, the operators actually filed for permits to extend the Skiway to the summit of Mount Hood, then down the north face to Cloud Cap before the entire enterprise stalled. In 1986 the first of Portland’s light rail lines opened, reaching out to the suburb of Gresham, 15 miles east of downtown. The system was an immediate hit with Portlanders, and soon there were enthusiastic calls for extending the tracks to Mount Hood. It was never to be, of course, simply because of the sheer cost of building a line on that scale (Government Camp lies 40 miles and nearly 4,000 vertical feet above Gresham) that would never draw enough passengers to justify the expense. Yet, it was conventional wisdom that some sort of public transportation to Mount Hood was needed. Could transit to Mount Hood work? During the recent economic downturn, the lack of a transit option has been still more glaring, with gas prices topping $4 per gallon, and an increasing number of Portlanders simply opting out of owning an automobile. For many skiers, hikers and mountain bikers, this once again raises the question: why isn’t there public transit to Mount Hood and the Columbia Gorge? The simple answer is that none of the public agencies with jurisdiction for the area is even considering the option. The Forest Service has placed a few conditions on ski resorts to provide limited transit, but otherwise is silent on public transportation. The Oregon Department of Transportation (ODOT) has the authority to step up, and even commissioned a 1999 feasibility study for the US 26 corridor. But instead of exploring the recommended transit options, ODOT has since focused its efforts on widening the highway in response to ski-weekend traffic bottlenecks, to the tune of nearly $50 million over the past 12 years. To date, only the National Park Service has embraced recreation transit, with bus and shuttle systems serving several national parks. This leaves ridesharing as the only viable alternative to driving alone to the trailheads for skiers, hikers and cyclists. While many hikers take advantage of sponsored hikes and informal meet-ups to take advantage of this option, there is no organized rideshare system available to the public. What would it take to provide meaningful transit to Mount Hood and the Gorge? This article attempts to answer the logistics of that question, and explores whether a system could actually designed with hikers and cyclists in mind. In this way, the proposal differs from past schemes in that it focuses on hikers and mountain bikers, not ski resorts. Over the years, many people have asked me about transit to Mount Hood and the Gorge, perhaps because they know I’m a transportation planner by day. And while my professional background made this proposal easier to assemble, it goes without saying that this is simply a “what if” concept. It’s meant to show just one way in which transit on Mount Hood might work. In the end, transit is a complex balance between ridership and service levels, and only a thorough transit study can produce a real plan. Instead, think of this as a hiker’s plan for transit, hopefully to spur some discussion! Here’s a closer look at how the schedules could work for these lines (these are clips from the Boot Loop map, shown above). All lines begin at the Gateway Transit Center, the nexus of three light rail lines on the MAX system and home to a large park-and-ride structure. Hikers already use Gateway as an informal meet-up site for ridesharing, so it’s a natural location for the Boot Loop. 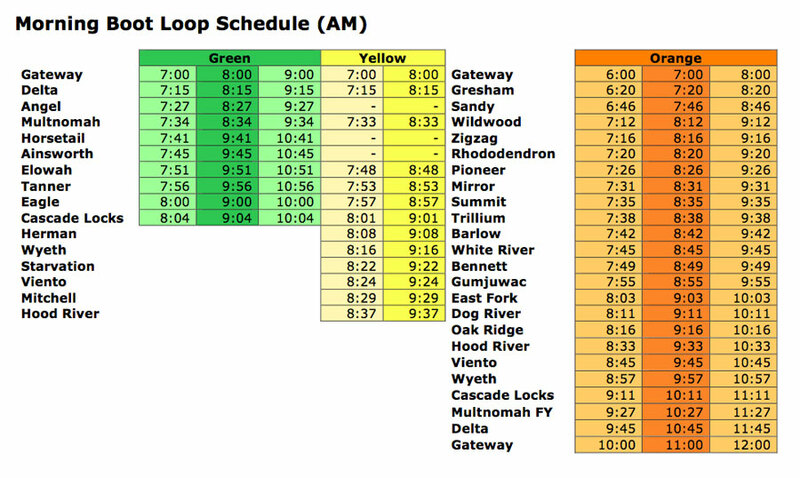 The proposed service starts on the hour, beginning with an early departure of the Mount Hood line at 6 AM and the Gorge lines beginning at 7 AM. A total of eight buses would depart in the morning on full service, summer weekends: three for Mount Hood, three for Cascade Locks and two for Hood River. All three lines would have additional park-and-ride stops, with the Mount Hood Line stopping at the Gresham Transit Center, Sandy City Hall and Hood River, and both Gorge lines stopping at a new park-and-ride at the Sandy Delta interchange (and trailhead). 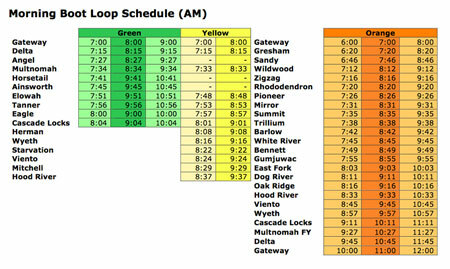 By design, the Gorge lines have several overlapping stops, with the weekend service provided by the longer Hood River line helping carry extra demand for the most popular western Gorge trailheads. Some Gorge stops would only have morning service, due to westbound freeway access constraints. These include the Eagle Creek, Herman Creek, Starvation Creek and Mitchell Point trailheads. With the exception of Mitchell Point, all have trail access to nearby trailheads that would have PM service, so this would mostly require some advance trip planning for hikers. If the completion of the Historic Columbia River Highway State Trail stays on schedule, Mitchell Point will soon have trail access to a nearby trailhead (Viento), as well. 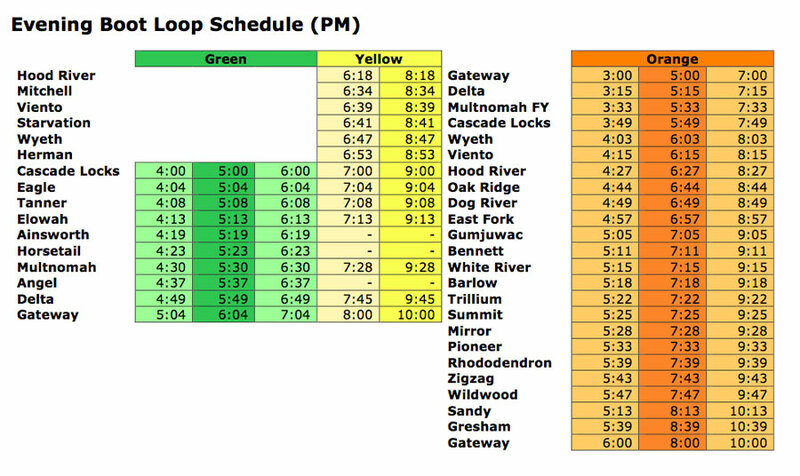 A closer look at the proposed bus schedule reveals another benefit of overlapping service: in summer, the Mount Hood Line returning through the Gorge provides additional mid-day and evening return options, giving hikers a lot of flexibility in planning their day. These times are competitive with driving, and if the service seems surprisingly fast, that’s because there are few stops on any of the proposed lines compared to urban transit systems. 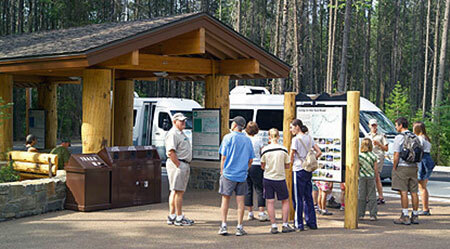 One of the unique considerations for recreation transit is providing shelter at the trailheads. While urban systems might be able to get by with a metal sign tacked to a phone pole, hikers would need more protection from the elements, especially if they arrive early for a return trip home. 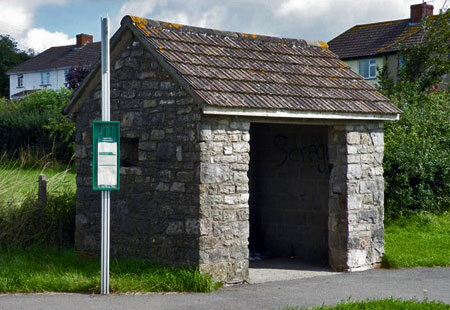 The National Park Service sets the standard for transit shelters, with substantial, rustic designs in its major parks. 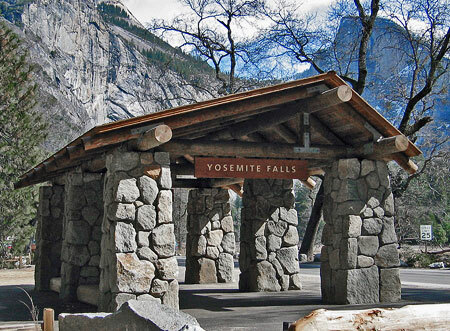 Similar designs would make sense for the most popular trailheads like Angels Rest, Horsetail Falls or Mirror Lake. For less busy trailheads, a simpler design could work, though the purpose of the structure is as much psychological as practical: it protects you from the elements, while also reassuring you that the bus will stop when it comes by. One reason urban transit providers avoid shelters is the cost of maintaining them, given the sheer number of stops in an urban setting (TriMet maintains more than a thousand shelters). 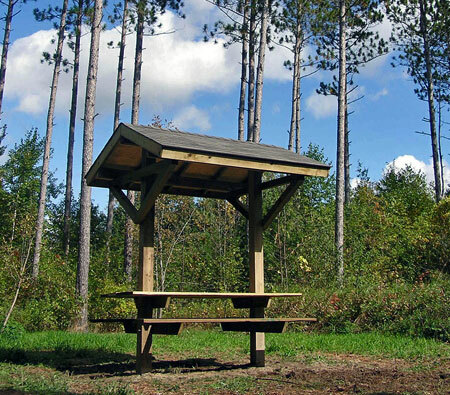 But in a recreation setting, the shelters serve anyone using a trailhead, which opens up a number of options for building and maintaining these facilities as multi-purpose shelters and interpretive stops. One of the persistent complaints about bus transit is simply the “closeness” factor, something modern urban buses have addressed in recent years with greatly improved ventilation and climate controls. Modern excursion coaches are even better, and the vehicles used in the Boot Loop would be like these vehicles — with coach seats, onboard restrooms and large cargo areas for bikes and packs. The tradeoff is seating capacity, with excursion buses generally carrying from 44 to 52 passengers. Buses also don’t have to be loud and polluting, anymore. Around the world, transit providers are increasingly looking at alternatives to diesel buses, with Asia boldly leading the way. 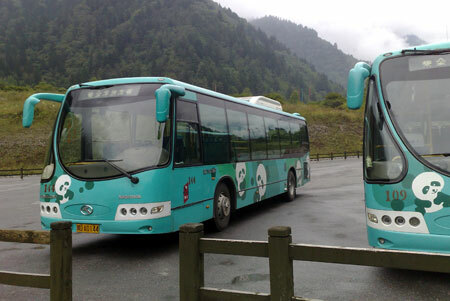 China used a fleet of 50 all-electric buses in the 2008 Olympics, bringing the technology into the forefront. Metropolitan Seoul, Korea now runs an all-electric fleet, and many other urban transit providers are moving toward electric vehicles. 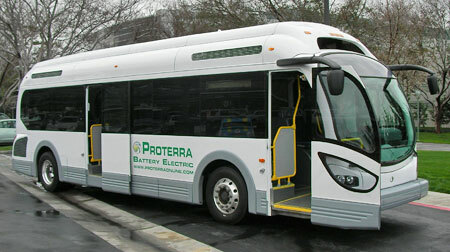 Current battery technology has extended the range of electric buses to almost 200 miles on a charge, easily meeting the requirements for the Boot Loop between charges. These vehicles are currently more expensive than diesel, but prices are coming down, and they have the advantage of zero emissions and much quieter operation — big advantages when operating in a natural environment. So, what would it take to bring transit to Mount Hood? For starters, an understanding that no transit system pays for itself with fares, alone. Just as automobiles pay for a fraction of the roads they require, transit typically recovers about a third of the operating expense with fares. With that assumption as a starting point, you can scale the total system accordingly, based on a rough estimate of fares. Let’s do the math: at peak operations, with eight buses carrying a full load of 44 passengers (based on the proposed schedule), the system could draw about 700 one-way fares on a summer weekend. If you figure about $10 for a one-way ticket (or $20 round trip per hiker), that would generate $7,000 toward the 36 total hours of bus operation per day needed to run the Boot Loop, or nearly $200 per operating hour. With most urban transit systems running operating costs of less than $100 per hour, this rough calculation seems to leave a lot of room for less-than-full buses and the other expenses of running a system, assuming an operating subsidy similar to what urban transit receives. Electric buses cost upwards of $500,000, and the Boot Loop would require eight (including a spare). Likewise, the system would require 30 new transit stops, some with sizable shelters. Thus, the front-end capital price tag to start up the system I’ve described here would easily be in the range of $5-7 million. This startup number sounds big, but in transportation dollars, it’s well within the realm of the possible. But the real commitment in providing transit comes in the ongoing support for operations. That’s where a useful model comes from Timberline Lodge, another venture for the public good that requires ongoing public dollars and private support to exist. The lodge is managed by a triad consisting of the U.S. Forest Service (which owns the lodge on behalf of the public), the RLK Company (which operates the lodge and ski resort), and the Friends of Timberline, a non-profit that advocates for the preservation of the structure. Together, these partners ensure that the public enjoys the successful operation of Timberline Lodge as a public/private endeavor as no single partner could. 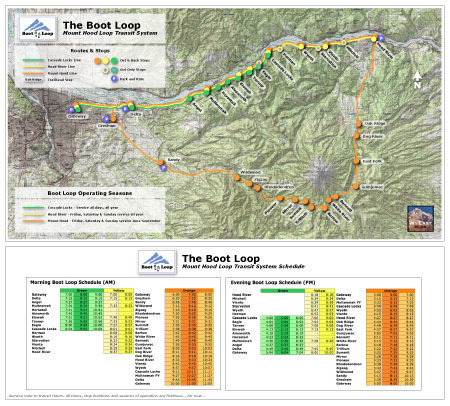 A similar model could work for the Boot Loop, with the Forest Service providing trailhead bus stop improvements, ODOT providing operating funds and vehicles, and a transit provider actually operating the system. TriMet could certainly operate it, but it could also fall to the City of Sandy’s SAM system to operate, or even a private operator. They key is an understanding by the partners that all three have a stake in providing successful transit — and this is where the Forest Service and ODOT still fall short. Another core premise behind this proposal is that hikers and bikers may be more motivated to use transit than the public at large, for reasons ranging from personal ethics (a more sustainable way to travel), convenience (relax or even sleep to and from the trailhead) to simple economics (cheaper than driving, and no car at the trailhead to get looted). Is this premise true? There’s no way to answer that question, short of a thorough market study, but this article is intended to help the conversation along. Transit does finally seem like the right solution at the right time for Mount Hood and the Gorge. If the demand is there, are ODOT and the Forest Service ready to step up? We’ll see.